One Perfect Little Miracle: Inspiration. I went back to see the First Emperor exhibit at the High Museum yesterday with my friend, Cilla. It was my third time going and I want to try and get back there at least one more time. It is an amazing display of what a vivid imagination, a slightly enlarged ego and a desire to create can do. The First Emperor, a young boy of 13, conscripted an army and set out to conquer China. He succeeded. Thinking himself the "Emperor of the Cosmos", he began preparing for the afterlife (that is where the ego comes in. He thought his rule would go on forever) . 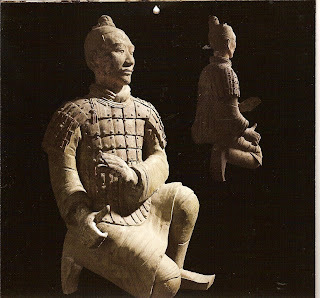 One thousand men, mostly convicts, were enlisted to create an army from terracotta. An army that would preserve the land and the safety of the Emperor. No detail was left unnoticed. Larger than real life, these clay soldiers were then set in place, ready to do the job they were created to do. Horses and chariots, musicians and acrobats were made as well. He would need entertainment, after all. The sheer enormity of the task that these men undertook is mind-boggling. These pieces were created over 2000 years ago. Their proportions are incredible and when you consider that each piece was built and fired in a kiln, then painted and set in place, it surpasses imagination. The "Why?" is supplanted by the "How?" and the result is awe at the talent these humble men possessed. This photo is from the calendar I purchased. You cannot take photos in the exhibit, this was the next best thing. This is the statue of an archer. He would have held a crossbow in his hands at one time, waiting to do the job he was made to do- protect the Emperor. Can you see the detail of his armor? I love that bold, graphic pattern. In the exhibit is a suit of armor made from limestone tiles and held together with patinated copper wire. It is stunningly beautiful in its simplicity. The colors are soft grays to greens and the shadows dance in and out from each tile. This is the inspiration for an art quilt that I am going to make. The result will, hopefully, be a quilt that will relate the strength of the armor while softening it a bit and showing the beauty that it holds. It may take a few more trips back to the museum, but I really don't mind. That's where inspiration is found. Ooh, another quilt I can hardly wait to see! You are right, the sheer ego of the child is amazing...but, look what it gave the art world...WOW! How wonderful to be able to see this, I am sure your quilt will be amazing. My daughter's biggest complaint about living in the country is "not enough museums". How nice that you can make several visits, it is hard to take in all that splendor at one look.